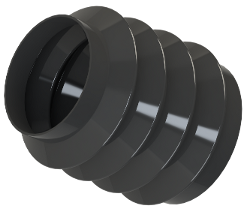 ERIKS (including all local Service Centre’s) offers a complete range of rubber bellows. This assortment consists of many configurations and are produced primarily from Neoprene® (polychloroprene CR). Neoprene offers good oil, weathering and heat-aging resistance. These bellows are used to protect cylinders and other machine elements against dust, water, and other chemicals. ERIKS has developed an on-line bellows selector to assist users in the selection of the proper bellows configuration. The user inputs connection diameter and length of the bellows, or can input the appropriate V6 part number. Most bellows are available from stock. Next to that, ERIKS can make custom made bellows. More information can be obtained by calling your local ERIKS establishment. An example of a bellow. Our decades of experience with rubber mouldings makes ERIKS capable of designing and developing specific rubber parts, often in close cooperation with the customer. The possibilities are endless. Where necessary, a rubber prototype can be made so that the bellow can be tested in practice. Production of very small to very large series of rubber mouldings is possible. Requirements for specific market segments are no obstacle for ERIKS. ERIKS designs and develops innovative solutions in custom moulded rubber. With our worldwide partners we offer fast delivery, competitive prices and engineering support. Our in-house CAD/CAM and FEA analysis and quality systems guarantee the best solution.